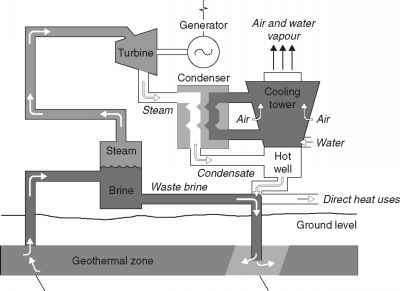 Direct- and flash-steam geothermal power plants utilise geothermal fluid with a temperature of between 180°C and 350°C. If the fluid is cooler than this, conventional steam technology will normally prove too inefficient to be economically viable. However energy can still be extracted from the fluid to generate power using a binary power plant. 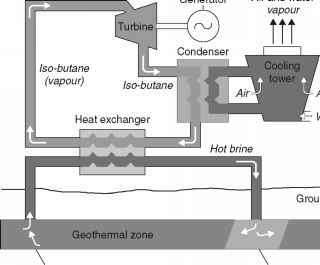 In a binary power plant the geothermal fluid is extracted from the reservoir and immediately passed through a heat exchanger where the heat it contains is used to volatilise a secondary fluid. This secondary fluid is contained within a completely closed cycle system. The fluid may be an organic liquid which vaporises at a relatively low temperature or, in the case of the Kalina Cycle,4 a mixture of water and ammonia. The vaporised secondary fluid is used to drive a turbine from which power can be extracted with a generator. From the turbine the vapour is condensed and then pumped through the heat exchanger once more. Thus the cycle is repeated. Figure 12.3 A binary geothermal power plant modular units often lend themselves to standardisation, reducing production costs. Several units can be placed in parallel to provide a plant with a larger power output. Although the normal application for binary technology is to exploit a low-temperature geothermal resource, the technology can also be used to generate more power from a flash plant. In this case the fluid left after flashing is passed through a heat exchanger before re-injection, allowing extra energy to be taken to power a small binary unit. Adding a binary unit to a conventional flash plant increases the cost but the resultant hybrid plant will have a larger power output. Geothermal power generation is frequently classed among the renewable energy technologies. Strictly this is incorrect. Geothermal heat is mined from the earth and the heat removed to generate electricity is not replaced. 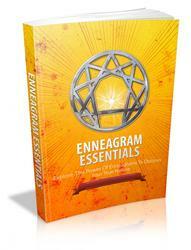 Nevertheless the amount of heat contained within the earth is virtually limitless in human terms. For this reason, if for no other, geothermal energy can be treated as if it were renewable. As already noted above, this is the position of the US Department of Energy which classifies geothermal energy as renewable. The construction of a geothermal power plant involves the same type of disruption that any civil engineering project entails. However to this is added the disruption associated with the drilling of wells to remove geo-thermal fluid from an underground reservoir and the re-injection wells to dispose of the fluid once it is exhausted of heat. Drilling requires significant quantities of water and this must be taken from local water courses. To minimise environmental effects, this should be taken from high-flow streams and rivers, preferably during the rainy season. Geothermal resources are often associated with natural features such as fumaroles, geysers, hot springs and mud holes. These are natural features which will normally be protected by environmental legislation, so drilling directly into a reservoir that feeds such features will often not be possible. These features may also have social and religious significance which must be respected. Management of the underground geothermal reservoir forms an important part of any geothermal project both on environmental and economic grounds. Continuous depletion of the reservoir will lead to a lowering of the local water table and may lead to subsidence as well as to a fall off in the quality of fluid from the boreholes. The quantity of fluid should be maintained by re-injection of all, or as much as possible of the extracted fluid. However re-injection can lead to a cooling of the reservoir. This can be avoided by carefully mapping the local flows and re-injecting some distance from the extraction site. Induced seismic activity has also been linked with re-injection, but a causal link is difficult to prove since most geother-mal projects are in regions of high or regular seismic activity. The emissions from a well-managed geothermal plant should be very small when compared with a conventional steam plant. Any carbon dioxide contained in the fluid from the subterranean reservoir will be released and there may be traces of hydrogen sulphide too. However the latter can be removed chemically to prevent release. The saline brine can cause serious groundwater pollution, as was experienced in New Zealand where the Wairakei power plant released 3500 tonnes/h of brine into the Waikato river. To prevent such pollution, modern geothermal plants re-inject all the extracted brine after use. Having identified a suitable surface site, pre-feasibility studies are likely to cost around $1 million, with a 30% change of failure. Test drilling, usually three wells at up to $2 million per well, has a similar prospect of failure. This risk can be reduced by careful surface study followed by prioritisation of the available sites. Such an approach has led to success rates for well drilling in excess of 83% in countries such as Indonesia, Kenya and New Zealand which have high-temperature resources. However success rates can be much lower where low-temperature resources are concerned. Once a usable underground reservoir has been located, its size must be determined. This involves fluid withdrawal over a long period; indeed it may not be until several years after production has started that a good picture of the resource can be obtained. Careful sizing of the geothermal plant to match the reservoir size will prolong the lifetime of a reservoir. This may not be possible if the plant has to be constructed before full data is available. Oversized plants such as that installed at the Geysers in the USA lead to a premature fall in output. Having identified a reservoir and assessed its potential, the risk associated with the power plant technology used to exploit it is minimal. All geothermal technologies in current use are well tested and predictable. New methods of exploiting the heat energy in the earth such as hot-rock techniques are still in an early stage of development and the risks here are large. However this technology is a long way from commercial exploitation. In common with many renewable resources, geothermal power generation involves a high initial outlay but extremely low fuel costs. In the case of a geothermal plant there are three initial areas of outlay, prospecting and exploration of the geothermal resource, development of the steam field and the cost of the power plant itself. Prospecting and exploration may cost as much as $1 million. This will weigh more heavily on small geothermal projects than on larger schemes. Steam field development will depend on plant size, as will the cost of the power plant itself, though small plants tend to be more expensive than larger plants. Table 12.2 shows figures from the World Bank for the costs of development of geothermal projects for different qualities of geothermal resource. A good resource has a temperature above 250°C, and good permeability so providing good fluid flow. It will provide either dry steam or steam and brine, with low gas content and the brine will be relatively non-corrosive. A poor resource may have a temperature of below 150°C, but it could provide fluid at a higher temperature with some other defect such as a corrosive brine or poor fluid flow. *Not usually suitable. Source: World Bank. As the figures in the table show, costs for a good resource vary between $1150 and $2300/kW depending on plant size. Where the resource is poor, large plants are not normally economically viable. Costs for small power plants under these circumstances vary between $2000 and $3700/kW. Further indirect costs will be incurred, depending on the location and ease of access of the site. These will vary from 5% for an easily accessible site and a local skilled workforce to 60% of the direct cost in remote regions where skilled labour is scarce. An alternative cost estimate from the US Energy Information Administration put the cost of a 50 MW geothermal power plant entering service in the USA in 2006 at $1700-1.800/kW. These costs will all be part of the initial investment required to construct a plant. Electricity production costs will depend partly on this, partly on financial arrangements such as loan repayments and partly on continual operation and maintenance costs. World Bank estimates suggest that power can be produced from a large geothermal power plant (>30 MW) exploiting a good quality resource at between $0.025 and $0.050/kWh. A plant of less than 5 MW could generate power from a similar resource for $0.050-0.070/kWh. With a poor quality resource a small geothermal plant can generate for $0.060-0.150/kWh. 1 World Status of Geothermal Energy Use; Overview 1995-1999, John W Lund, Geo-Heat Center, Oregon Institute of Technology, Klamath Falls, OR, USA. 2 Development of Hot Dry Rock Technology, Helmut Tenzer, GHC Bulletin, December 2001, p14. 3 World Energy Council, Survey of Energy Resources, 2001. 4 The Kalina cycle is a special thermodynamic cycle designed to obtain maximum efficiency from low-energy resources such as low-temperature geothermal fluids. 6 Refer supra note 5.